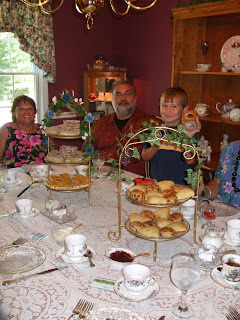 The family gathered around the tea table at Tea For You in Hope Valley, RI this past week as we shared stories, show and tell, and much laughter. 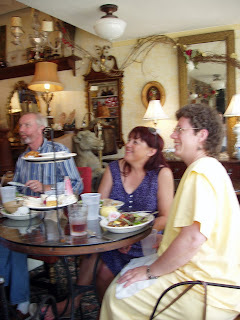 Tea for You is a private tea room in a homey, country Victorian setting. 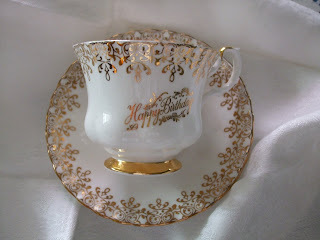 Lace-covered tablecloths, crystal plates, and fine china tea cups grace the tables. 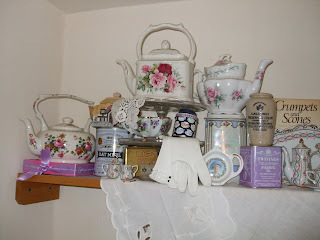 Tea related trinkets adorn the walls and shelves. The first course began with a tomato basil soup followed with a fresh fruit cup. 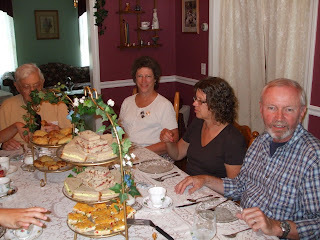 The tiered tray with sandwiches and scones was presented with simple fanfare. A nice variety of sandwiches were served which included chicken curry salad, veggie bars, and a ham and pear sandwich with cinnamon butter. 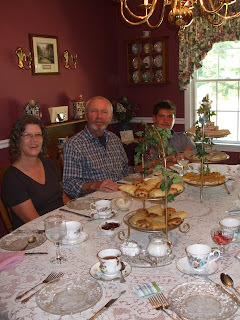 In addition, there were plain scones and cinnamon chip scones. 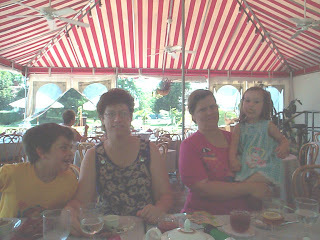 Pots of hot tea (darjeeling or black currant) were forthcoming throughout the tea party. Dessert included madelaines, a mini cheesecake, and a coconut bar. In addition, iced tea was offered with dessert. To complete the menu, a tea cup full of colorful mints was presented at the end of the afternoon. Throughout the event, the owners sons entertained young and old with magic tricks that left you wondering how they performed them. It was a delightful and entertaining afternoon. 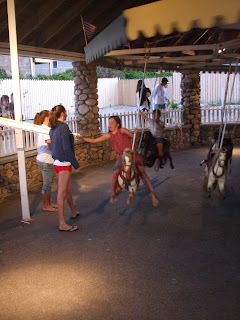 A favorite beach vacation activity includes a visit to The Flying Horses of Watch Hill. There are 20 horses, suspended by rods from overhead, with no platform underneath. As the ride increases its speed, the horses swing out on their rods, hence the name. 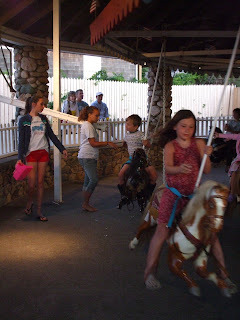 It is believed that the carousel was made in 1867 by Andrew Christian and the Charles W.F.Dare Co. of NYC. It is said that a traveling carnival brought the carousel to Watch Hill in 1883 only to later abandon it. 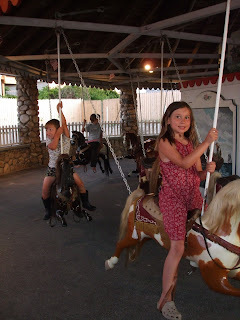 Recently refurbished in 1993, it is supposedly the only surviving flying horse carousel in the country and also the oldest, continuously operating carousel in the United States. This delightful ride has endured disasters and hurricanes and yet it continues to entertain children of all ages. There are two rows of horses, with the outside horses providing an opportunity to grab a 'gold ring'. As the horses fly around the carousel, a long 'arm' is extended which distributes metal rings. Any child lucky enough to catch a 'gold ring' will win a free ride. As the kids collect rings, they place them on the horses ear for safekeeping. 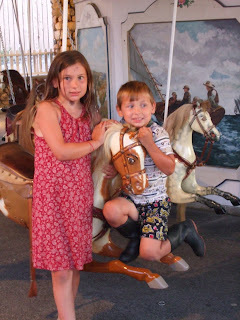 These two smiling kids number among the 50,000 children that ride the carousel each season. 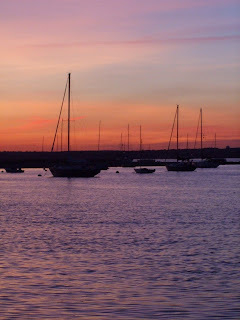 At the RI beach that we visit you won't find a board walk or gift shop or even salt water taffy. 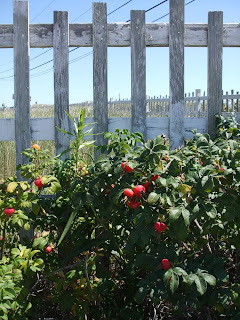 Instead, at summer's end, the entire path from the car park to the beach is lined with beautiful red ripe rosehips, the fruit of the rose, nature's gift. The round brilliant red or orange seedpods of rose bushes, large or small, new hybrids or old-fashioned, grown in your garden or wild along the beach, are entirely edible, and make a desirable addition to the year's herbal harvest. 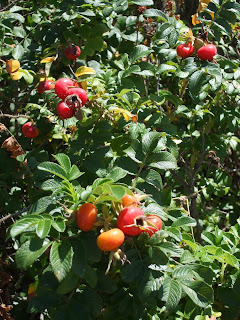 Gathering rosehips is one of the most satisfying joys of the fall season, provided you have heavy duty gloves and sturdy clippers. To preserve your harvest, we suggest, drying them whole to use in fall arrangements, holiday wreaths or other festive designs. If you want to preserve them for later use in a tisane (a herbal infusion), it's best to coarsely chop the large rosehips in a food processor before air drying and storing in an air tight tin. Rosehips yield a pretty pink brew, rich in Vitamin C.
To make the tisane, add about 1/2 teaspoon of the crushed hips to a cup of boiling water; steep five minutes until the color is bright pink. Add sugar, honey, or lemon if you like, and by all means try it with cloves and cinnamon-stick stirrers. (excerpt from Bertha Reppert's A Heritage of Herbs, 1976, Stackpole Books). One final getaway before the new school year begins took our family to Charlestown, RI for a week at our sister's beach house. It has become an annual excursion, and quite an enjoyable week, with different themed activities, such as Pirate Day or Wild West Day. 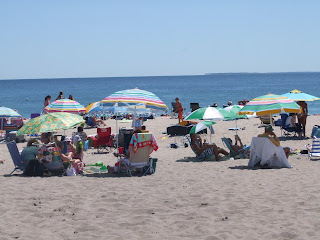 On this particular day, we loaded the van with chairs, beach towels, sand buckets, snacks and kids (young and old) and headed to the beach. 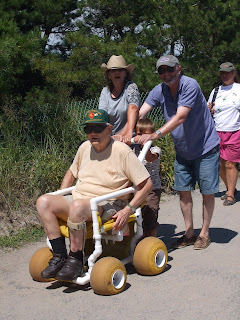 The old boy utilized the beach buggy chair that is provided by the town. 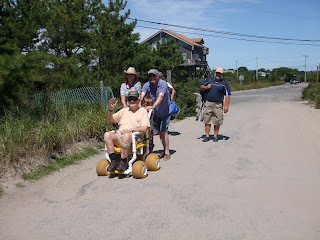 Huge wheels supposedly make it easier to push on the sand, but that hasn't been confirmed. 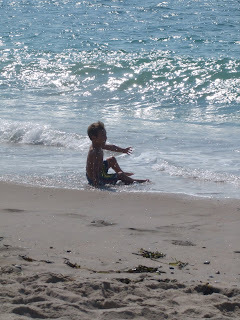 Even before we had our spot on the beach picked out, this little guy was out running, jumping, chasing waves, having a grand time. Just don't tell him the sea life is also swimming and playing with him, tickling his toes on occasion. Some things are best left unsaid. Fairies sit to have their tea. They eat their dainty fairy cakes. A name card sits at every place. Just inside the small oak door. 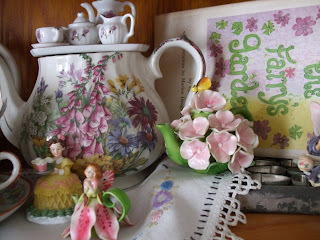 Invited to a fairy's tea? Alas, we are not sure who deserves credit for this sweet poem, but thought we would share it with you. ...a tea fanatic maybe? 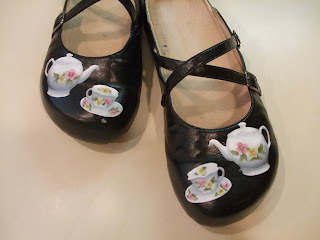 Several years ago, while at a local craft show, we found these clever hand-painted shoes - every design imaginable, except a tea theme. I requested and ordered, sight unseen, a pair of tea themed shoes. I wear them only on special occasions, typically a visit to a tea room. ....the difference between a reception and a tea is one of atmosphere only, like the difference in furnishing twin houses. A reception always takes itself seriously. 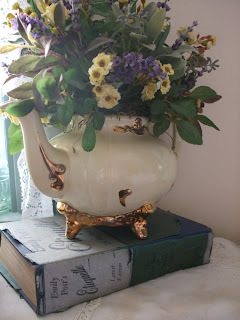 A tea, no matter how formal it pretends to be, is friendly and inviting. One does not go to be impressed or instructed, but merely to see one's friends and be seen by them. Emily Post's Etiquette, The Blue Book of Social Usage, is on display in the tea room, a handy reference for anyone seeking answers to all their questions about socially acceptable things to do in any situation and on any occasion. 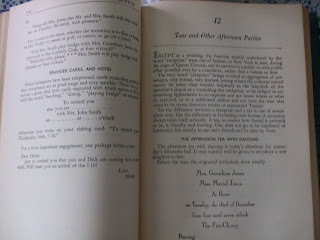 Several passages refer to Afternoon Tea including a menu for, proper clothes for, table equipment for, and afternoon tea with dancing and without dancing. Alas, the 72nd printing, in 1948, which is the copy I have, makes no reference to cell phones. To be enjoyed all winter! We are frequently asked what this plant is. Milkweed (Asclepias) is easily recognizable by the milky sap it exudes when you cut the branch. We planted it as a host plant for the Monarch butterfly. The monarch likes to lay its eggs on Milkweed. Alas, I haven't found any eggs yet. I think it is because we don't have a field of milkweed just a small patch. The cones are the seed pods. Inside the cones are lots of white cottony pieces each with seed attached. Once mature the pods will pop open and the wind will carry the seeds around the neighborhood, eventually creating our own field of milkweed. The dried mature pods are often used for crafts. This hearty weed is growing out in the back alley. It is such a pretty plant and people often ask what it is. There are many kinds of "Dock" named weeds, this one got its name Burdock from those burr like flowers that reach out and grab hold of your clothing or animal fur as you brush by it. Many people remember playing with the burrs and making doll chairs and other creations with them. The original Lego perhaps? In the early 1940's a Swiss inventor studied the hook and loop system used by the seeds to attach to his dog's fur and that was his inspiration for the invention of velcro. Articum lappa, a biennial (two year plant), can grow quite tall up to 4 or 5 feet with a sizable tap root to hold it in place. In Asia, the tap root is eaten as a root vegetable. In the United Kingdom, it is sold as a soft drink. Medicinally, the seeds of this plant are used for excessively dry skin and the root serves as a mild diuretic. The harvest is coming in quickly now. 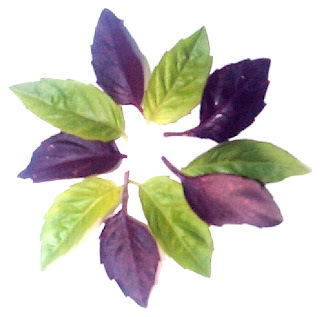 We keep our freshly harvested basil in water on the counter top and enjoy its fragrance before we use it in cooking. Putting the basil in the fridge will often cause it to turn brown BUT if you have a frost free fridge you can dry your basil! Here's how: Pick approx 20-30 leaves or 10-15 stems and put them in a clean brown paper lunch bag. Fold the top down and place a paper clip on the bag to keep it closed. Write the name of the herb and the date on the bag. Then simply put that bag in your refrigerator. It will take approximately 2 weeks for the herb to dry (or technically dehydrate). Then move your basil into a glass jar, preferably brown glass) and store in a dark, cool place. Enjoy yummy fresh dried basil all winter in spaghetti sauce, vegetable soup, or sprinkled on salads. This drying process works well for herbs that otherwise lose flavor or scent and color such as tarragon, the fruit flavored sages, lemon or lime balm, parsley, scented geraniums, and rose petals. This "Cool" way to dry herbs comes from our friend Herb Bayshus who's famous for a lot of quotes including: "Always remember to enjoy a full and healthy life, add a dash of Herbs and a pinch of Spice". 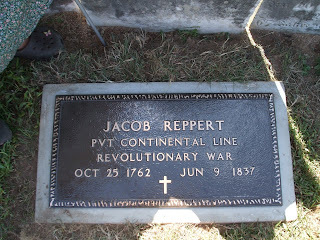 This past Saturday marked the Grave Dedication honoring Private Jacob Reppert, a Revolutionary War Patriot and our Great Great Great Great Grandfather. Under blue skies and balmy breezes, the Gov. Joseph Hiester Chapter Color Guard, dressed in the uniform of the Provost Corps (Military Police) led by Floyd Turner II Presented the Colors to begin the ceremony. 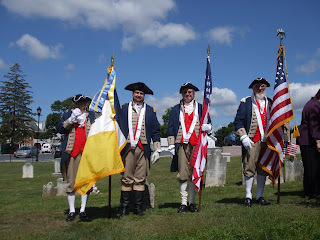 Although General George Washington formed a Provost Corps very soon after assuming command of the Continental Army, it went through many changes until 1778 when a dedicated force of Light Dragoons under the command of Captain von Herr was established. Private Jacob Reppert served in the Provost Corps under Captain Bartholomew von Herr. At the end of the war, Washington requested that some members of the Provost Corps be retained after the rest of the army had been furloughed as he could not do without them. Thus, members of the Provost Corps were the last soldiers to be furloughed. When Private Reppert left the army, he settled back into the Oley Valley. He was married to Margaretha (Schneider) and had ten children. This special dedication ceremony was organized and coordinated by our cousin, Bruce Reppert. 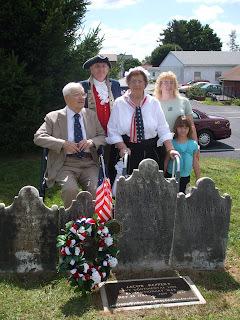 Many members of the Reppert family were in attendance to recognize the contribution our ancestor made to the freedoms of this country. Not only a ceremony to honor Jacob Reppert, this ceremony was a tribute to all military personnel that have served and are serving our country; for which we are thankful. For additional information regarding this dedication, please read the article that appeared in The Reading Eagle. One of the sisters of Rosemary's Sampler is celebrating a special day today! Now, can you take a gander at how it is celebrated? An extremely hardy perennial which spreads by root, the charming seed pods are reminiscent of Chinese paper lanterns, so it is obvious how this plant got its name. The proper name is Physalis alkenkengi, Physa, means bladder referring to the inflated calyx. We grow this ornamental plant primarily to use as a dried flower. It dries easily as it maintains its shape and beautiful orange color. At Halloween big bundles of these dried flowers really set the scene for us. Inside each lantern is one fleshy fruit and inside that fleshy fruit are about 40 seeds. I have read the ripe fruit is edible for jams, but the unripe fruit is poisonous. We have never cooked with it here. Has anyone else? We also enjoy growing this plant to keep our garden fairies happy. The lanterns make for quite a festive late summer party for them! Fennel, a tall, perennial herb is in bloom. Reaching five feet, this plant provides contrasting height to the herb garden while the foliage offers a tasty addition to fish dishes. Simply lay the fresh fennel on the fish and bake, broil, grill, fry as you like. 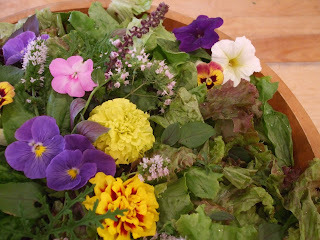 The feathery foliage also conditions nicely to be added to fragrant herbal bouquets. After it is done flowering, it will set its seeds. Fennel foliage and especially the seeds have an anise or black licorice flavor. Fennel is one of the "meeting seeds" of olden days, when a colonial lady attending an all-day prayer meeting would carry a little packet for nibbling during the endless sermons because Fennel both tastes good and also chases away hunger pangs. In tea, the anise flavor lends a natural sweetness to the brew. In addition, it is said that a cup of fennel tea will help to quiet colicky babies and will also help to bring in a nursing mother's milk. Fennel is also a host plant for the Swallowtail caterpillars. This dark fennel plant is the bronze fennel variety and the caterpillars are not as camouflaged as they are on the green branches of the common fennel, Foeniculum vulgare. Another edible flower, a blooming hibiscus always provides a glorious display in the garden. 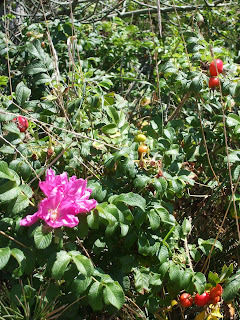 This one rewards us with blooms all summer which we use to make a real show as a garnish on an appetizer plate. We will remove the pithy center and use the blossom as a bowl for a dip. It also adds a very tasty citrus-like flavor to herbal tisanes. The blossom and all its glory only lasts a day, but it surely grabs our attention and makes us smile when it's in bloom. 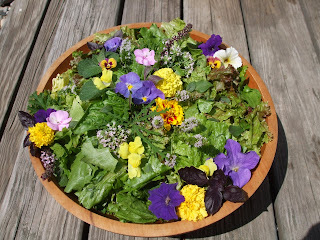 and served with our Honey Poppy seed Dressing, a nice lightly flavored dressing that complements the herbs and flowers. Whisk all ingredients together. Gently toss with freshly washed salad greens. Our Delightful Fairy Festival is coming up next month on September 6th and 7th. We will dance with the fairies, dress in our finest fairy fashions, mine for gem blessing stones, play in the castles, listen to delightful harp, lute, and hang drum music, ride unicorns and create flower power bracelets. Carla Nelson author of the book Beyond Betwixt Between penned this poem. And all those fairy things. Between Betwixt Beyond is a fairy book that presents an enchanting herb/garden tale featuring modern day fairies and the adventures they have interacting with human folk over the course of one eventful summer.